When it comes to deathcore, there is an acknowledgement that the music is going to go down one direction, and ignore some other ones. With a pile of bands gravitating towards the heaviest, most brutal side of things that they can muster (including the breakdown within a breakdown tactic) this is the common ground. Forgoing most other avenues and simply attempting to be the heaviest band possible. 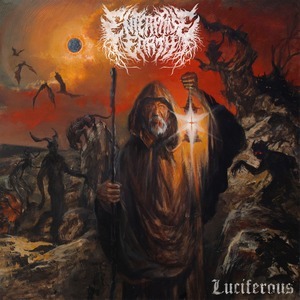 While Enterprise Earth fully subscribes to this philosophy, they make some notable attempts to add some different flavors into the formula on Luciferous. To get things out of the way, Enterprise Earth isn’t the type of band that is revolutionizing the genre. They have harsh, downtuned chugs by the gallon and it’s their main trade. For what it’s worth, it does work for the band. There’s enough death alongside the ‘core that the brutality keeps things steamrolling from beginning to end. The breakdowns usually have some purpose to them, even if you can see them coming a mile away and they are frequently relied upon as a major energy source. Dan Watson’s vocals run the gamut of extremity, from guttural lows to high shrieks, and do serve their place as adding to the heaviness of the group. It’s all well and good, but for the most part, all of these components are commonplace in the genre nowadays, so the band pulls out a few tricks on occasion. There’s a more melodic presence that they entertain, more on the latter half of the disc, and employ some synths and near melodeath melodies to counter some of the more straight-ahead viciousness of the meat & potatoes riffs. This is most apparent on the 8-minute closer “There is No Tomorrow.” The extended runtime helps, and they run into some surprisingly catchy melodies and acoustic moments (and even a few clean vocals for those interested). It’s a nice example of the band expanding their palette beyond the traditional deathcore clichés. While they are still very much rooted in some of the more tried and true deathcore approaches, Enterprise Earth gives some hints of innovation that they should attempt to exploit next time around. It’s not necessary to change their entire approach, but more melody to go along with the brutality is bound to bring them a bit closer to the forefront.